Many women traveled, but few wrote publicly about their journeys. Five of these women did, and one kept a private diary, only recently published. Filled with details many men overlooked, their accounts demonstrate the ways in which our social and cultural situations shape our perceptions of the natural world. Anne Newport Royall. Sketches of History, Life, and Manners, in the United States. New Haven, Conn.: Printed for the author, 1826. Barrett Library. Sketches of History, Life, and Manners is the first of five travel books Anne Newport Royall published from 1826 to 1831. Royall was particularly well-suited to discuss the Virginia landscape, having lived in Sweet Springs Mountain and Charleston before becoming a professional travel writer and newspaper editor. In her "Journey to the Atlantic States," she describes her journey down the Shenandoah Valley to the west of the Blue Ridge, which she says "mingles amongst the clouds, and has more the appearance of a blue cloud than a mountain." Harriet Martineau. Retrospect of Western Travel. Vol. 2 of 3 vols. London: Saunders and Otley, 1838. McGregor Library. From 1834 to 1836 Englishwoman Harriet Martineau traveled throughout America, lecturing in support of abolition and observing the nation's economy, manners, and landscape. Her commentary on America appears in Society in America (1837) and in the narrative Retrospect of Western Travel, in which her well-known account of Virginia's Natural Bridge appears. Caroline Howard Gilman. The Poetry of Travelling in the United States. New York: S. Colman, 1838. Barrett Library. One of the most popular female writers in the South during the mid-nineteenth century, Caroline Gilman was the author of eighteen books and the publisher of one of the earliest American magazines for children. In The Poetry of Travelling in the United States, Gilman describes a visit she made to Weyer's Cave, now Grand Caverns, located northwest of Charlottesville near the South Fork of the Shenandoah River. Fredrika Bremer. The Homes of the New World: Impressions of America. Vol. 2 of 3 vols. Trans. Mary Howitt. London: Arthur Hall, Virtue and Co., 1853. Born in Abo, Finland, Fredrika Bremer traveled widely, visiting Europe in 1820-21; North America and Cuba in 1849-50; and Palestine, Turkey, and Greece later in life. Although the letters she wrote during her North American tour were not originally intended for publication, Bremer decided to publish them after her return to Sweden. The result was The Homes of the New World, in which she describes her visit to "Charlotte's Ville" and nearby natural attractions. Amelia M. Murray. Letters from the United States, Cuba and Canada. New York: G. P. Putnam and Co., 1856. A well-known British writer, botanist, artist, social worker, and traveler, Amelia Murray visited Charlottesville, Staunton, Lexington, and the Natural Bridge on her tour of the South. A perceptive observer of the landscape, Murray notes at one point, "Of the Rocky Bridge I have often heard; but neither books nor travellers, familiar to me, have spoken of these forty miles of scenery" passed through by the James River Canal. Mary Jane Boggs Holladay. Journal. 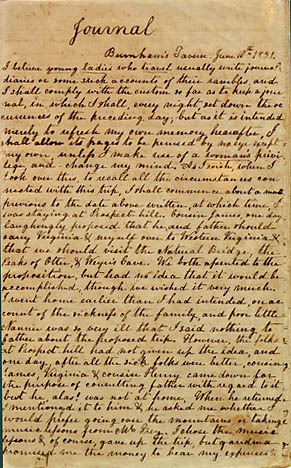 Manuscript, June 1851. I believe young ladies who travel usually write journals, diaries or some such accounts of their rambles, and I shall comply with the custom so far as to keep a journal, in which I shall, every night, set down the occurrences of the preceding day; but as it is intended merely to refresh my own memory hereafter, I shall allow its pages to be perused by no eye except my own, unless I make use of a woman's privilege, and--change my mind.